Cancer cure requires eradication of all malignant cells. Cancer growth, however, requires proliferation of malignant cells and normal cells. The several anticancer treatment modalities currently available, including surgery, chemotherapy, radiation therapy, and immunotherapy, have been envisioned to target primarily the malignant cell. Research over the past 35 yr has reinforced the hypothesis put forth by Folkman that, without the proliferation of normal cells, especially endothelial cells, a tumor cannot grow beyond the size of a colony (1). The consequence of this finding is that both the normal cells and the malignant cells involved in tumor growth, as well as the chemical and mechanical signaling pathways that interconnect them, are valid targets for therapeutic intervention. 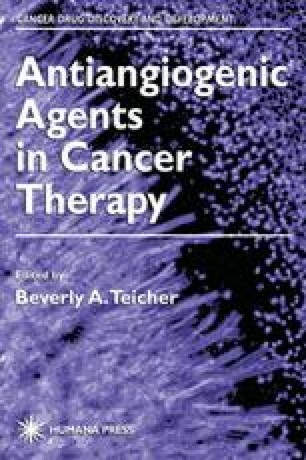 The integration of therapeutics directed toward the vascular components, extracellular matrix components, and stromal and infiltrating cells, with classical cytotoxic anticancer therapies, may be regarded as a systems approach to cancer treatment (2).